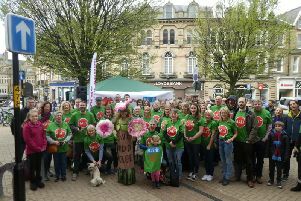 Dancers dazzled as they helped to raise over £22,000 for sick children and young people last weekend. Competitors set the stage alight for the Martin House Hospice Care for Children and Young People’s Strictly Get Dancing contest at the Engine Shed in Wetherby last Saturday. Emmerdale actress Charlotte Bellamy, ex-Royal Ballet dancer Laura Hatton and Martin House dad Roger Fielding were among the judges. Sarah Jepson and Johnny Fantauzzo were crowned champions, winning the Glitter Ball trophy. The pair both work for Martin House and signed up for the competition after seeing first-hand how the hospice supports families. Sarah said: “We are over the moon to have won Strictly Get Dancing this year. In total 14 couples performed a waltz, a samba and a group American smooth, which they learned in just six weeks, with lessons from dance teacher Jean Harvey. Competitors Dee and Alan Lazenby won an award for most improved dancers, and Jim Geall, a Martin House dad, won most innovative fundraising for holding a dog grooming day. So far the event has raised £22,000 for Martin House, with more money still coming in. Bhranti Naik, community fundraiser and Strictly Get Dancing organiser, said: “It was a fantastic night, all of our couples did a phenomenal job – the standard of dancing was so high. Martin House cares for children and young people with life-limiting conditions, from across West, North and East Yorkshire, at its hospice in Boston Spa, in hospitals and their own homes. The Boston Spa-based hospice has nine bedrooms in Martin House, and six in Whitby Lodge, which cares for teenagers and young adults up to the age of 30 (and sometimes beyond). Services include respite stays, symptom control, emergency care, community care and end of life care. There is no cost to any of the families using the services. It costs in excess of £8 million a year to provide this care, the majority of which comes from voluntary donations and fundraising.